WINSTON-SALEM, N.C. – March 16, 2017 – Youth football organizations can benefit from the presence of a certified athletic trainer at their practices and games, according to an anecdotal report by researchers at Wake Forest Baptist Medical Center. The report, published in the journal Athletic Training & Sports Health Care, is based on the researchers’ experience in having a trainer at most practice sessions and games of a youth football organization with more than 170 players ages 6 to 13 during two consecutive seasons. 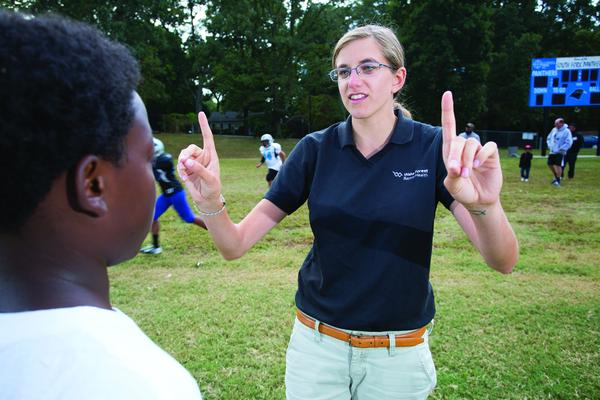 “While expense is an issue that has to be addressed, having an athletic trainer is feasible for youth football organizations, is appreciated by parents, and may enhance player safety through improved injury awareness, prevention and assessment,” said the report’s lead author, Jillian E. Urban, Ph.D., assistant professor of biomedical engineering at Wake Forest School of Medicine, a part of Wake Forest Baptist. In addition to assessing injuries – which ranged from minor contusions and sprains to fractures and concussions – the trainer suggested steps to make the playing environment safer, such as creating an emergency action plan and assisting individual players with conditioning, stretching and other practices. The trainer also served as an injury prevention and safety resource to coaches, players and parents, and was available for one-on-one advisement, demonstration and education when deemed appropriate. The number of injuries incurred by the organization’s players during practices and games fell from 25 in the first season to 14 in the second, though factors other than the trainer’s presence may have contributed to that decline, the report says. Funding for the project was provided by the Matthew Gfeller Foundation, the Childress Institute for Pediatric Trauma at Wake Forest Baptist Medical Center and its Christopher Budd Fund for Pediatric Trauma Education, and the South Fork Panthers of Winston-Salem Inc. The hiring of the trainers was done in conjunction with a study of head impact exposure in youth football players that was funded by a grant from the Childress Institute. Co-authors of the report are Erica K. Cheramie, L.A.T., A.T.C., Joel D. Stitzel, Ph.D., and Daryl A. Rosenbaum, M.D., of Wake Forest Baptist; Johna K. Register-Mihalik, Ph.D., and Jason P. Mihalik, Ph.D., of the University of North Carolina at Chapel Hill; and Mary Kopacki, M.S., of Innovative Athletic Training, Greensboro, N.C.